The first international ice hockey championship the United States won after the Miracle On Ice came in 1987 when a U-17 team featuring future pros like Jeremy Roenick, Mike Modano and Tony Amonte served notice that America was about to become a hockey power. The goalie that anchored that team was Buffalo native Ken Baker. An elite prospect, Baker would go on to play college hockey at Colgate before a slow and bizarre deterioration of his skills made him walk away from the game. It wasn’t until years later that it became clear the reason why no matter how much he worked out he couldn’t gain muscle, or why a grown man would have lactating breasts — it was a brain tumor that had been throwing his hormones, and by extension his entire body, into chemical disarray. Tumor removed, healthy, and working successfully as a celebrity reporter for Us Weekly almost a decade after his athletic peak, Baker decides to go for it, to abandon his job and spend a year on the comeback trail attempting to play professional hockey and find out if he really could’ve been good enough. Baker eventually hooks up with the Bakersfield Condors of the minor pro West Coast Hockey League as their unpaid third-string goalie and the adventures that follow are what makes up the bulk of They Don’t Play Hockey In Heaven. The human story, the highs and lows of Baker’s comeback attempt are riveting. Baker’s a professional storyteller and he unfurls his story with the sort of masterful touch you’d expect of any good writer. 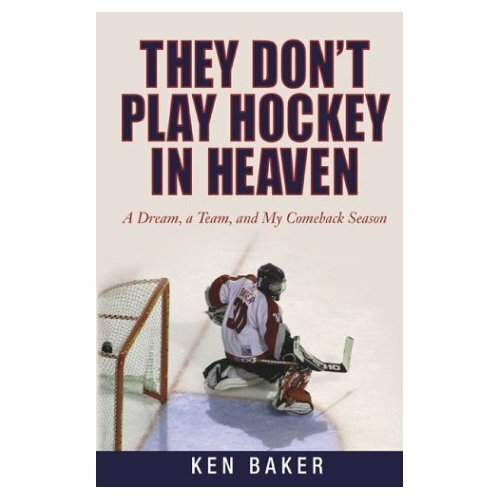 On its own, that’s more than enough to make They Don’t Play Hockey In Heaven: A Dream, A Team, And My Comeback Season a worthy read. What elevates the book further though, is the hockey observations. The intimate insider details about what it’s actually like to be a pro hockey player. To live the day-to-day grind, the bus trips, the crappy motels, the constant pain and injuries, the endless drinking, the ruthless Darwinism of it all… short of rodeo riders and professional wrestlers there’s perhaps nobody who willfully destroys themselves for glory in the same way as minor pro hockey players and Baker captures that reality. Any hockey player who has made it to a certain level — like, say, anyone who got dropped to third string for a dozen games because some hotshot that everyone hated became available from tier II — will understand these dynamics intimately, but few have been able to articulate them with Baker’s clarity. For anyone who’s wondered what its actually like on that next level up the ladder, this is your answer.